This would make a great teen craft, (or an adult one if you're like me:). 2. Each additional button should face the opposite direction as the previous button. 3. Push the buttons together as you go. 4. 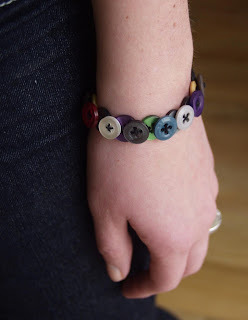 Your bracelet should look layered like this. 5. When you finish, create a loop at one end to hook over the last button on the other end. (Or you could use any sort of jewelery latch to finish it off). What a great tutorial! I do craft tutorials on Mondays! Found my way here from "Friday Follow" and am now following you! I'm following you now. What a cute blog you have! I really wish I could figure out how to do those cute tabs across the top! Stopping by from Friday Follow! this is adorable thank you! Great idea, this my daughter will love. She is a tween of course. Great Blog.....Love the ideas and tutorials! I'm a new Follower of yours, Happy FF! Stopping by via Friday Follow... and so glad I did. This is the cutest bracelet. I am so happy to be your newest follower! Such a cute idea.. I've been reading your blog for some time now and so enjoy your ideas! I love this bracelet and I've been meaning to make something like it for myself. I love colorful buttons! Loved this idea. Hope it was okay that I linked to you on my blog! Ooooo cute. Love to see fellow crafties. From Friday Follow & now follow you! This is so creative! I love that it is double layers. I'll have to give it a try. I am definitely gonna make this! so cute!! thanks for the tutorials! your blog is wonderful! I love this idea, & have linked you on my blog faithofallcrafts.blogspot.com. I hope that is okay. This is so cute! Take your beading wire and gently fold it in half. Don't squeeze the fold though....you don't want to stress the wire. Slide your toggle end over one of the cut ends of the wire and slide it down to the mid way mark where your fold in the wire will be. Take the two cut end of the wire and feed them both through a small coordinating bead (I used a 2 mm silver bead in my example.Next slide on two crimper beads over the two wires as with the previous bead. Leave enough wire running through the toggle end to have a relaxed loop (don't make the wire loop that holds the toggle too small....the toggle should be able to flop about a bit) . Crimp your crimpers.Now feed through your focal bead also running the two wires through the bead. Follow the bead up with two more crimper beads (also run both wires through) and crimp them. That is super cute! I would so wear that! I love this idea! I have a ton of buttons from my mother-in-law that passed several years ago. I think it would be cool to make bracelets from her buttons for our granddaughters, would have been her great-granddaughters. Thank you for such a great idea! I love this idea! I have to make one of these! I'm a new follower! this is so cute!!! im gonna try this for sure!!! Now I know what to do with that tin full of buttons I got from my mom's sewing room! My girly girl 7 yr old will LOVE this! I'll bookmark your blog and check once more here frequently. I'm quite sure I'll be informed lots of new stuff right here! Best of luck for the following! We're a gaggle of volunteers and starting a brand new scheme in our community. Your website provided us with helpful information to work on. You have done a formidable process and our whole group can be grateful to you. I'm gone to say to my little brother, that he should also go to see this webpage on regular basis to take updated from latest gossip. I read this paragraph completely on the topic of the resemblance of latest and earlier technologies, it's amazing article. revisit once again since i have bookmarked it. Money and freedom is the greatest way to change, may you be rich and continue to guide other people. For most up-to-date information you have to go to see world wide web and on web I found this website as a best site for latest updates. get data regarding my presentation focus, which i am going to deliver in institution of higher education. I don't have time to browse it all at the moment but I have bookmarked it and also added in your RSS feeds, so when I have time I will be back to read a great deal more, Please do keep up the great job. Kindly sir, send me the vedio clip on ways to use printer for pcb. something. Afterward merely follow Aaron guide. Fun . to read articles, but this blog offers feature based content. bookmarkіng and аdding your RSS feed to my Google account. will talκ about this site with my Fаcebоoκ group. This functions a surprise ! !, I rejoice I discovered your article! My ML-1210 is still chugging along with Home windows 8 now. I've read several good stuff here. Certainly value bookmarking for revisiting. I wonder how much attempt you place to make this type of great informative website. extremely appealing, many thanks a lot! What's up Dear, are you genuinely visiting this website regularly, if so then you will absolutely take good knowledge. Hi, I'm additionally a Shapeways member, north of Toronto. Could you send me an email while using the approx cost for making the pendant and cufflinks? I too make jewellery and discover the price tag on SW slightly prohibitive for small items. I wonder how people get such fantastic ideas to make unique and trendy things. I bought Kate Spade necklace for my mother on her birthday. She loved it. If I would find it earlier then I could present her handmade bracelet. She would love that.